You can also contribute specifically to a program. 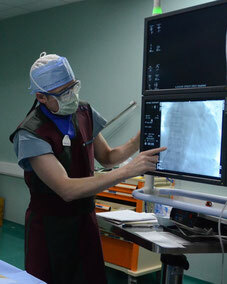 At the moment we have two main programs; cardiology and neurosurgery. The interventional cardiology program was kick-started in 2013 with a group of three medical pioneers travelling to Tanzania. The group consisted of two cardiologists; Dr. Peter O'Brien, and Dr. Chad Hoyt, and a specialist nurse; Jordan Slayton. Under their supervision rural access (Bugando and Mbeya) to echocardiography and cardiovascular evaluation was developed. Not much later, in close collaboration with Dr. Mohamed Janabi the first cardiac catheterization lab in Tanzania was build at Muhimbili National Hospital (MNH). This resulted in the first heart catheterization in Tanzania in January 2014, and the first coronary stenting in February 2014. With the help and teamwork of Centra Health, Medical University of South Carolina, and Madaktari, a total of 141 catheterizations have been done to date (October 2015). Much work remains to be done, and cardiology is yet another example of the applicability and efficacy of the “Train the Trainers” method. The neurosurgery program started back in 2006 when only three Tanzanians out of the country's population of 45 million practiced neurosurgery. People with injured brains and spines, road accidents are very common in Tanzania, either healed on their own or died. 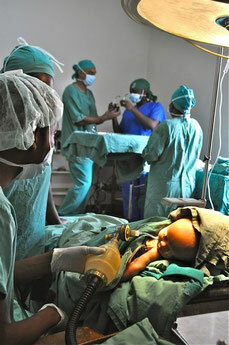 By now, the number of neurosurgeons in Tanzania has more than quadrupled and are able to perform complex interventions saving children born with hydrocephalus and brain tumour removal. Interventions that would challenge the most experienced Western neurosurgeons. Better yet, when researchers studied the data on patient outcomes and other quality factors, they found that the quality of neurosurgical interventions was comparable with formally trained neurosurgeons at other African hospitals. Cardiology and neurosurgery are our core programs. In addition, we have set up primary care and emergency care units in different parts of Tanzania. We are now looking for more, and long lasting funding, in order to expand our programs further. Within Tanzania, and beyond. Can you help? Either by volunteering, or donation, please let us know.